Every year, the iPhone launch is deemed as one of the most hyped launches in the tech community. But in recent years, competition has increased and we’re slowly seeing that hype wash out, especially when other companies are coming out with equally good or better hardware. Last year Google held their first ever hardware launch event for the original Pixel, while the event lacked glamour the product quickly blew people away. The camera on the Pixel was the best among any smartphone at the time and it quickly became a favorite among Android purists and enthusiasts. Recently we covered the acquisition of HTC’s Pixel team by Google. This move gave Google more control over the hardware they push out and just this week at the October 4th MadeByGoogle event, the company showcased what they’ve been up to in the past year. This post is going to cover everything launched at the October 4th Google event. Google has clearly pivoted on its goal. It’s aggressively pushing AI and has transformed itself around that mission to become an AI first company from a mobile-first company. In to make that transition possible Google has baked in a lot of intelligence into its products and services. AI is the theme for everything announced at the event. It makes sense too because we have come to a point in time where radical hardware innovations are not possible on a yearly cycle, in this case hence they’re relying on software innovations to make the device feel truly revolutionary. Let’s go through the list of products that were announced this week. Late last week Amazon held a surprise event in Seattle where they announced a bunch of new Echo devices. At a high view level, the smart home ecosystem looks like it’s dominated by Amazon’s presence but the truth about it is that we’re only in the early days in this area and there is a wide playing field for companies to innovate and deploy. Google announced the Google Home last year at I/O it’s a smart speaker with the power of Assistant baked in. Google Home has been doing really well in its one year of existence and since smart homes have just started becoming a thing, Google wants to give consumers as many options as possible. 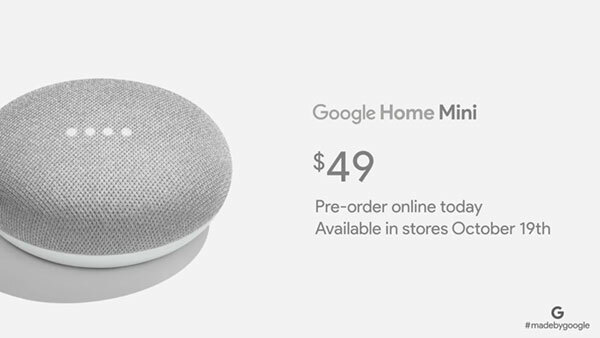 The king of search is now trying to become the king of voice search with an ambient presence in your life and to do that, it announced the Google Home Mini. The mini is a boiled down version of the original Google home which fits perfectly in the palm of your hands. It retails for $49. It looks elegant and will perfectly fit the decor of your home. Being so small doesn’t mean that it’s inefficient. It can pick your voice up from across a room and can even get loud enough for you to be able to hear it. It is available in 3 colors, coral, charcoal and chalk and charges via a micro USB. It’s available for preorders and will start shipping by the end of the month. The $49 price point is really making it look like a killer option compared to the Amazon Echo Dot. 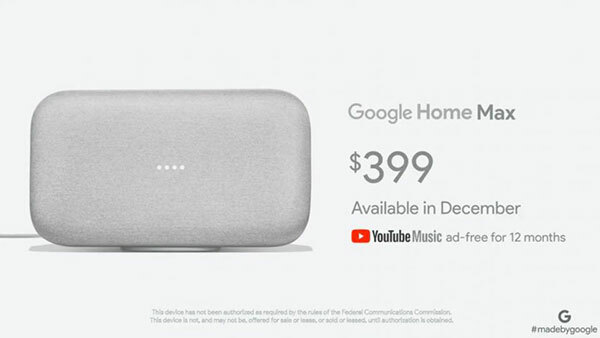 While the Google Home Mini is trying to lure users who’re not yet onboard with the idea of a smart home, the company is not leaving out the premium customers who are looking for high-quality audio in their homes. This is where their next product comes in. The Google Home Max is the elder brother of the Mini. It’s big and I’m not overstating this, and because it’s big, it packs some serious specs in. It’s got two 4.5 inch woofers and two tweeters and it gets pretty damn loud with some punchy bass. Whats interesting with the mini is the fact that it intelligently able to equalize the audio output by actively listening to itself and detect it’s placement in the room. Even though it gets loud, it’s able to pick up the “Ok Google” hot word just fine. The look of the Home Max is similar to the Mini with a fabric top to add elegance to your home decor. You can place it either horizontally originally vertically according to your desire and it has a magnetically attachable base to aid you in doing so. It supports Bluetooth and Google Cast and also auxiliary input. This one comes with a USB C port and an ethernet connection as well if you need a wired connection. The Home Max retails at a price of $399 and will be available late this year. The Chromebook is an interesting device. It’s popular among students who just need a cheap device with reliable software to get their homework done, and among casual users who are mostly for web browsing and media consumption. It’s a barebones platform that gets stuff done. Last year Google created a marriage between Chrome OS and Android apps, bringing the vast catalog of Android apps with native support to the Chromebooks which made them look like a seriously capable platform to switch to. But for creators and developers, that’s just not it. Nothing can match the flexibility and prowess of a Windows machine or a Mac. 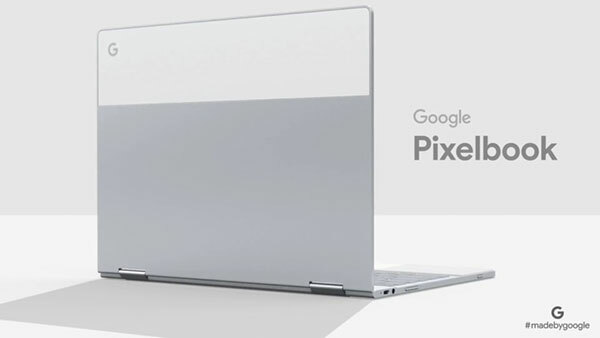 Google is trying to address this with their new device, after discontinuing the Chromebook Pixel last year, they’re back in the game with the Pixelbook. It’s a stunning, well built, thin and beautiful laptop that also doubles as a tablet once you flip the screen. But the basic question still remains and that is, is it worth spending over a 1000 dollars on Chrome OS? And the answer is yes. The Pixelbook does everything that a laptop at this price bracket is capable of doing and I’m looking right at the MacBook Air for comparison. On the looks department, the Pixelbook gets high scores. It’s incredibly thin at just 10mm and weighs under 2.5 pounds. It’s made out of high-quality aluminum but with some striking similarities to the Pixel phones. It is completely fanless so you know it’s gonna be absolutely quiet. On the specs department, the Pixelbook comes with Intel Core i5 Kabylake chipset and an i7 option as well. The keyboard is extremely well spaced out so typing is not an issue at all. It’s also backlit. On the ports department, the Pixelbook is packed with 2 USB C ports and it comes with a 45W charger which is capable of charging the device for a 2-hour usage in just 15 minutes and the Pixelbook runs for 10 hours on a single charge. The Pixelbook has an accessory to go along with it, the Pixelbook Pen. It doesn’t require any pairing of any sort and works just like the Wacom stylus does. It uses an AAA Battery for power and can last about a year. The pen has extremely low latency and Chrome OS uses machine learning to predict where the pen is going to be. The Pixelbook Pen has a button on it which will invoke the Google Assistant, you can circle anything on the screen and the Assistant will look it up for you. The Pixelbook starts at $999 and the Pixelbook Pen would cost you an additional $99 they both ship at the end of this month. 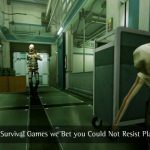 AI first world was the theme of Google’s October 4th event and they made sure they packed the smarts into everything that they announced. Even if it were the smallest one. 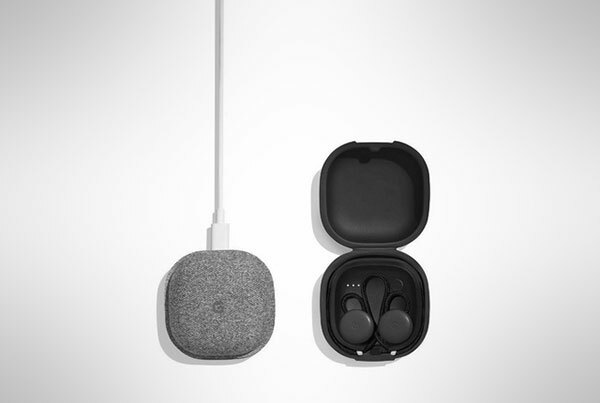 The Pixel Buds, a pair of wireless earphones that Google launched fall into that bracket. It borrows a lot of ideas from the AirPods like the effortless pairing, a battery case, and touch controls. Not to forget they have a tight integration with the Google Assistant. They’re priced at exactly the price at which the AirPods come in, $159 and will be out in November. But that’s not it, there’s other stuff in here as well. First, their design, like a lot of Google’s hardware mentioned above, these make use of fabric as well. The neckband which connects both earbuds serve another purpose, they attach to your ear externally making sure you have a comfortable listening experience without having the device stuffed in your ear canal. The charging case has the same external look as the other devices. You control the Pixel Buds with gestures on the right earbud, tapping means pause and swiping would change the music. But let’s get to how these earbuds are smart. Google Assistant is at it again, you just hold your finger down on the right earbud and start talking and it will send your voice to the phone immediately. The headline of the Pixel Buds is the translation feature. The earbuds can translate between 40 languages. How it actually compares against the AirPods is only something that time will tell. There’s one more interesting thing we’ve got to cover before getting to the star of the show. 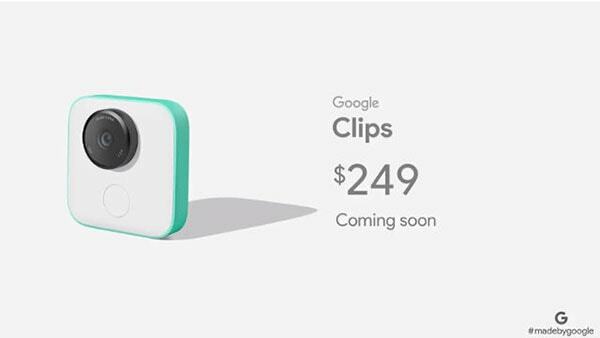 It’s Google Clips, it’s a smart camera that Google announced. Clips is a camera with some neat tricks. You set the camera up, turn it on and place it somewhere interesting and it uses AI and machine learning to record 7-second clips of stuff which it flags as interesting. It’s a product for parents and pet owners in mind. It has 12 MP camera with 8 GB of onboard storage so you can capture a tonne of those clips. You can later scrub through those clips and select just the frame you want as your image and save it on your phone. Nothing recorded by the Clips is sent to Google it stays on the device and is encrypted. It has an LED to let others know that they’re being recorded. It’s square in shape and doesn’t look creepy like a spycam. It comes in at $249 but according to Google, the priceless memories it captures justifies its price. And finally, it’s time to talk about the thing you and most of the internet has been eagerly waiting for. 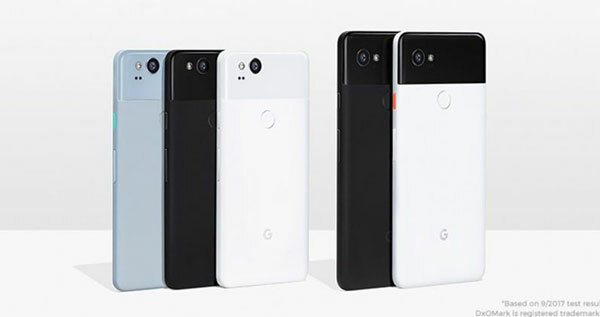 After the massive success that Google’s last year Pixel phones had, the company announced the new Pixel 2 and Pixel 2 XL at their MadeByGoogle event. The new Pixel phones are significant upgrades from last year’s model. Let’s go over all of them. The Pixel 2 and Pixel 2 XL feature an all-new design which carries over some of the aesthetics from the last year model. The Pixel 2 and Pixel 2 XL have a dual tone back with matte finish metal on the entire body with a glass accent on the back. They come in 3 colors, kinda blue, just black and clearly white, thanks to the weird naming scheme the company is going with. The smaller Pixel 2 comes with a 5 inch full HD AMOLED screen while the bigger brother will sport a 6 inch POLED QHD+ screen. Both the Pixel 2 and Pixel 2 XL come with the latest Snapdragon 835 processor, 4 GB RAM and either 64 or 128 GB of internal storage. What’s new here is the IP67 water resistance which was one of the things missing on last year’s phones. The camera was a huge selling point for the Pixel last year and this year too they’ve managed to shake up the industry. Last year the Pixel got an 89 on the DxO mark rating and this year they blew away the competition with a 98 on that scale. Google has packed some serious guts into the camera of the Pixel 2. For example, without the requirement of a second lens, the camera is capable of taking Portrait photos with the Bokeh effect thanks to machine learning. The cameras also pack in both OIS and EIS for buttery smooth video capture. On the Pixel 2 XL things have changed radically. The phone sports 2880 x 1440 resolution with curved edged and an almost edge to edge display. The phones have dual front-facing stereo speakers which get pretty loud too and they have a new gimmick called Active Edge which basically lets you squeeze the bezel to activate Google Assistant. Android has also been modified a bit for these 2 phones with exclusive features like the preview of Google Lens which is now capable of visual search and the ability to actively listen to music so it can detect the song playing in a store and give you a notification about the same. The Pixel 2 and Pixel 2 XL will be the first phones to ship with native AR capability and Google showcased that with AR stickers. With AR stickers you’ll be able to add 3D characters and emoji into your photos and videos and have them move around as if It were a scene. The Pixel 2 and Pixel 2 XL will also support an always on display to allow you to quickly glance at your notifications without waking up the device. The Pixel 2 starts at $649 and ships October 17th the Pixel 2 XL starts at $849 and ships early November. All in all Google’s holiday lineup of devices are packed with innovation and have something for everyone. As time passes and it becomes increasingly difficult to create innovations in hardware, software is what will keep the industry moving forward and with their October 4th event, Google just showed how that would be done. I’m a fan of stock Android phones, I can’t wait to get the Pixel XL 2, excited to replace my Galaxy S8+. Pixel phones are good but again Google is missing the trick with their price tag. If they have similar price tag as of Nexus devices, these would sell like Hot cakes. Whatever be the innovation, Google would always lead the industry. Thank you, Prateek Phoenix for your valuable information. Google one of the best sites in this world and I think their products will be best like there search engine.